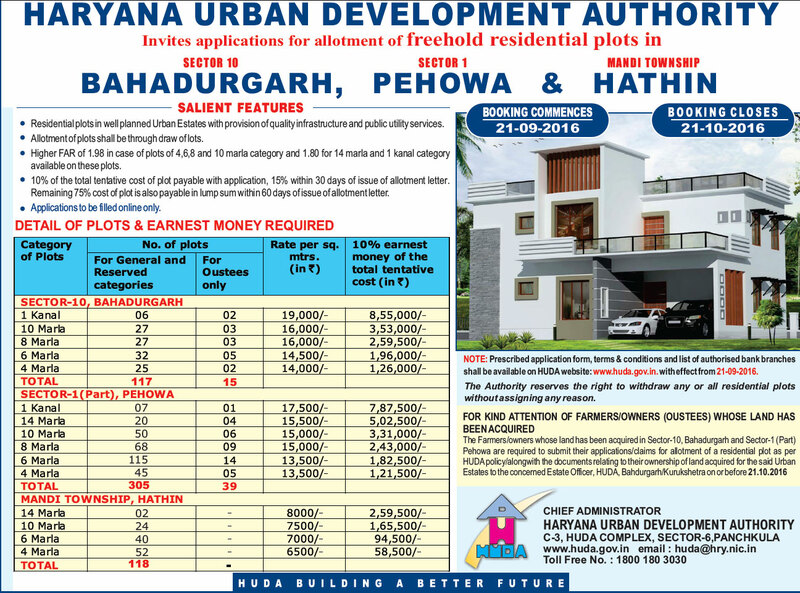 HUDA (Haryana Urban Development Authority) invites applications for 132 freehold residential plots under HUDA new plot scheme 2016 at Sector-10 Bahadurgarh (Urban Estate). Along with this plots, the authority has offering housing units in Sector-1(Part) Pehowa(New Urban Estate) and Mandi Township Hathin. In the new housing scheme of HUDA, total 594 freehold residential plots at above locations. HUDA Bahadurgarh Plot Scheme 2016 comprises of 132 housing units for which registration has been started from yesterday 21 September 2016. Plot in the scheme are available in the sizes 1 Kanal (8 Units), 10 Marla (30 Units), 8 Marla (30 Units), 6 Marla(37 Units) and 4 Marla(27 Units). HUDA has offering these freehold residentila plots at rate of Rs. 19,000/- per square meter for 1 Kanal; Rs. 16,000/- per square meter for 10 & 8 Marla and Rs. 14,500/- per square meter for 6 Marla and Rs. 14,000/- per square meter for 4 Marla Units. Application for plots in HUDA new housing scheme are being offered through offline mode of registration which can be done within the registrtion period from 21 September 2016 to 15 November 2016.
of Plots No. of plots Rate per sq. Registration for the allotment of plot in the scheme has been started from 21 September 2016 and application for the same can only submitted online by using the official website of HUDA at www.huda.gov.in. In the online application, the applicants will have to fill all the information such as Applicants Name, Father’s Name, Category, Bank Details, etc. After filling the application form, the next step is for Payment of earnest money which can either be made online by using payment gateway or it can be deposited in the authorised banks by generating the Chalan Form from the HUDA website. The applicants will also have to submit a charge of Rs. 500/- along with earnest money which is Non-refundable. The list of bank branches for submitting payments is available in the brochure which can be download by using the link “Download Brochure” below. Any individual, who has ever been allotted a plot of land directly by HUDA in Urban Estate Bahadurgarh shall not be entitled to apply under this scheme. Who have acquired a residential plot in HUDA area by way of purchase from open market or through re-allotment. Whose spouse or dependent children have acquired a plot by way of allotment or otherwise in Urban Estate Bahadurgarh developed by HUDA. Who already own a group housing flat or any kind of non-HUDA residential property in Urban Estate Bahadurgarh. For complete eligibility criteria download the brochure of the scheme by using the link mentioned below.